Actress Amrita Arora poses for a picture after her wedding ceremony at a restaurant in Mumbai on March 4. Newlyweds Amrita Arora (L) and Shakeel Ladak pose for the shutterbugs in Mumbai. Actor Salman Khan poses for a picture after attending the wedding ceremony. 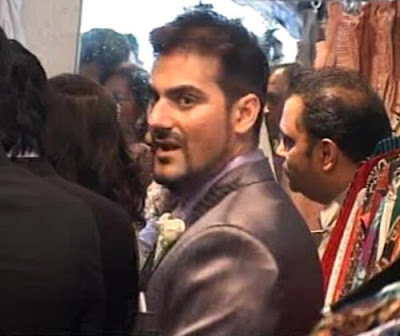 Amrita and Shakeel’s wedding was graced by Bollywood biggies that include Gauri and Shah Rukh Khan, Anil Kapoor, Fardeen Khan and Zayed Khan with their wives along with Twinkle and Akshay Kumar, Preity Zinta and Ness Wadia, Urmila Matondkar, Priyanka Chopra, Mehr and Arjun Rampal, Manish Malhotra, Tusshar Kapoor and Saif Ali Khan to name a few. Amrita was dressed in an off-white vintage wedding gown designed by fashion designer Ashley Rebello. Bridesmaids Kareena Kapoor, Malaika Arora Khan, Salman Khan's sister Alvira and close friend Mallika wore peach coloured gowns. Actress Kim Sharma arrives at the wedding venue. 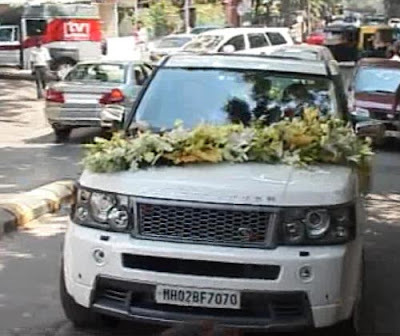 A flower-decked car waits for Amrita and Shakeel.